To celebrate the 50th anniversary of the 20th century’s greatest flight achievement, this book chronicles how 400,000 men and women across the US worked to transport human beings across a quarter million miles of hostile space to an unexplored world, and how they ensured that the seven million engineered parts invented to fly this single mission all worked perfectly. The first Moon landing in July 1969 captured the world’s imagination like no other space event before or after. 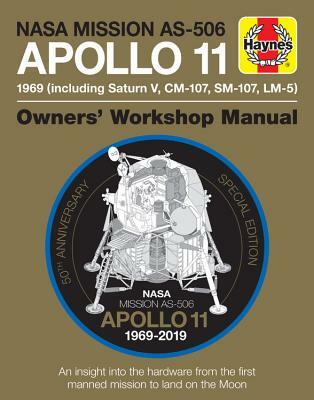 Now, a half century later, the Owners' Workshop Manual series presents a fascinating insight into this unparalleled mission, from the raw, fire-breathing power of the mighty Saturn V rocket to the individual stitching on a pressure-suit glove. You'll also find a new look at the legacy of Apollo 11, how the Apollo missions inspired Elon Musk and Jeff Bezos to think big and create the current SpaceX and Blue Origin programs, and a look forward to future manned Moon missions and deep-space exploration. The engaging, insightful text, accompanied by remarkable photos and technical images, bring arguably the greatest-ever feat of engineering and human endeavor to life. Dr. Christopher Riley is a broadcaster and filmmaker specializing in history and science documentaries. In 2004, he won the Sir Arthur Clarke award for the BBC1 blockbuster series Space Odyssey: Voyage to the Planets. His film In the Shadow of the Moon: The Story of the Apollo Astronauts, won the World Cinema Audience Award in 2007. Phil Dolling is an award-winning executive producer who has worked for the BBC on many television programs, including Tomorrow's World, Space, Human Instinct, James May's 20th Century, and Earth: The Power of the Planet. He was also in charge of the coverage of the Total Eclipse in 1999. Phil has also written books and articles on the science and technology of the 20th century.